From the moment they arrive on campus, UNH students are supported in their quest to identify a pathway to rewarding careers and in their preparation for life after college. The UNH Career Center is a lifelong resource for Wildcats that can help with choosing a major, finding internships, preparing for interviews, applying to graduate school, even changing careers decades later. Taking advantage of these services is one way that UNH students parlay a strong undergraduate ecducation and graduate education into a future career. Each year, the UNH Career Center holds two Career & Internship Fairs. Each fair, over 1,500 UNH students/alumni and over 200 companies attend. Students from all majors attend the fair. Where is Wildcat country? It's everywhere! Graduates with a degree from UNH start their careers anywhere, from New England to California to Singapore. With 133,000 alumni living in the U.S. and in 78 countries across the globe, your Wildcat alumni network is there to support you. UNH's Pathways Mentoring Program pairs interested students with alumni in year long, one-on-one partnerships to help them develop career and networking skills. Alumni partners have either a similar major or work in a professional field that is of interest to the student and are able to provide first-hand knowledge of what to expect in the professional world after graduation. Don't forget about social-media as a networking tool. 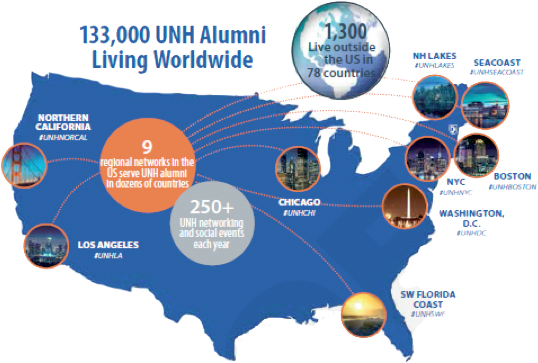 With almost 90,000 alumni and students in the official UNH group on LinkedIn, it's a great time to become a member and start connecting.